The girls and I are planning to make a fairy house today. My daughter is hoping to catch a fairy who paints butterflies. I want an Editor Fairy. Decorate a giant cheeseball container to create a lovely post modern design. Stock the house with lots of tiny books and a mini Keurig with coffee and English teas. Place the house in a shady reading spot under a tree. Tweet "Rent-controlled fairy house on shady block. Books included." Writing will be so much easier with my Editor Fairy! When I can't find the sweet spot between vivid language and leaving room for the illustrator, she will guide my hand. When I think a manuscript is done, she will tell me to edit again and again and then one more time for good measure. We will enjoy lovely picnics while I pitch all the crazy book ideas which pop into my head. "Do Princesses Poop?" She will let me know there are already 40 books about princess potty time. "Alligators Don't Get Pinched on St Patrick's Day?" Sometimes she will just sigh; but I will get the point. I hope she can magically lick envelopes too, because we will be sending a lot of submissions once she arrives. She will study each word on my queries. She will change "I am unpublished and have no idea what I am doing but you seem like a super nice editor and I know we could be friends" to "Thank you." She will say "just keep writing" when the rejection letters come. And on rare days she will tell me I have written something simply magical. I will feel like I'm flying and wonder if she dropped pixie dust on me. Then one afternoon, the phone will ring. A publisher will be sharing good news! I will call for my Editor Fairy, but I won't be able to find her anywhere. Yes, I must catch an Editor Fairy. What else should I include in my Editor Fairy House? Please share your ideas in the comments! This is such a cute post - I want an editor fairy. 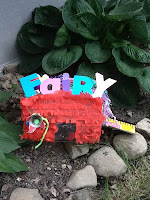 I can't really think of what else to include in an Editor Fairy house. Chocolate, maybe? Pretty much everyone loves chocolate. Of course chocolate! How silly of me to forget that. Now, Hershey Kisses or Godiva? Probably Godiva. Seems like in this day in age, every fairy house should have free WiFi. The most professional editor fairies may be deterred from moving in if they do not have a way to stay "connected". Editors really are demanding. I suppose the Editor Fairy can use our WiFi as long as she is cooperative with all 127 questions and musings I have for her each day. I need an editor fairy too! I imagined the house being really cute too, until I let two little girls loose with a bunch of glue and crafty bits. The main focus became covering the kitchen table with glue and puff balls, but they did manage to get a few things on the house. Seriously though, having someone you could ask about every crazy writing question that pops in your head? Priceless.